On June 11, 2015, the author of Twice Heroes: America's Nisei Veterans of WWII and Korea, was invited to speak at Marines Memorial Club and Hotel Meet the Authors series. Over 70 veterans and family members sat mesmerized by a series of hundreds of Tom Graves veterans' portraits. Tom spoke about writing Twice Heroes, the history of the Nisei Veterans, and read portions of the veterans' interviews as their images graced the screen. A wine reception and extended question and answer period ended the evening. Tom presented a signed copy of his book to Marines Memorial Club President, retired USMC Major General Mike Myatt, for the club's library of military titles. 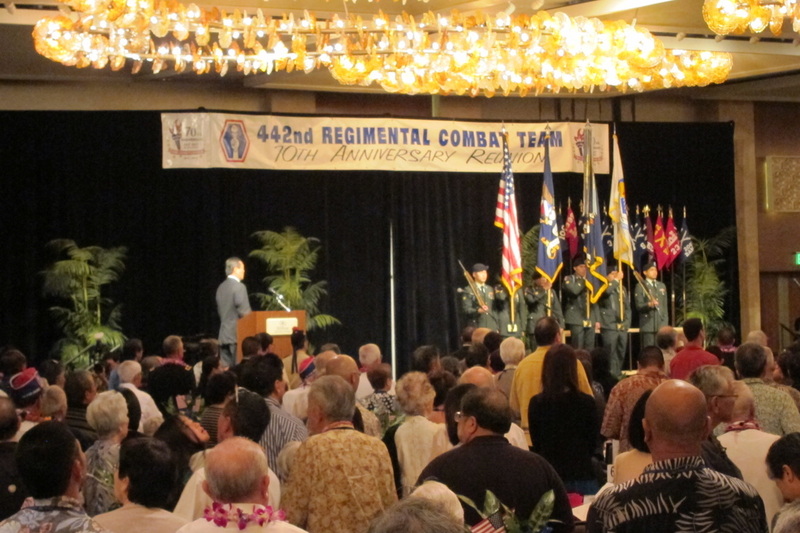 Ceremonies in Honolulu in March of this year marked the 70th Anniversary of the segregated 442nd Regimental Combat Team of WWII, the most decorated American military unit in history. Seventy years ago, the 442nd joined the Nisei 100th Infantry Battalion and the secret Military Intelligence Service, the MIS, already in action against the enemy. This, while their families were confined in bleak internment camps throughout the war. Nisei veterans say they fought for their families, and to prove their loyalty to their country, the United States of America. Young Nisei soldiers fought to keep it "the land of the free, and the home of the brave." Mistrusted at first, the Nisei record of loyalty and achievement earned them America's highest honor, the Congressional Gold Medal, presented November 2, 2011, in the United States Capitol. See the 70th Anniversary Edition. The Nisei veterans' Congressional Gold Medal departed the Japanese American National Museum in Los Angeles (where Twice Heroes is available in the museum store), and arrived at the de Young Museum in San Francisco on June 29. At the de Young opening ceremony, Congresswoman Nancy Pelosi quoted from Twice Heroes and acknowledged author Tom Graves' important work.